PACKO is a beachfront hostel located nearby the most beautiful beaches in Danang City. Within 3km radius, you can access to several marvelous sites of city including Marble Mountains, Cham Museum, Dragon Bridge, Han Market, Han River, Danang Cathedral, Son Tra Peninsula, etc... not given the city airport and railroad are just 4 km away, we have souvenir stores and outstanding seafood restaurants just couple mins of walking. More than a basic bedding service, we aim to 'local experiences' and 'friendship' - that means you feel free to ask us anything to make your trip more local and affordable - you are more than welcome to say hi and smile to other travelers. Built under the concept of nature conserving and eco friendly, we have garden - yard -basketball court - open space kitchen. Even if you choose not to stay with us, no worries. just drop us a line or so with questions, we are more than happy to provide you local guidance. We are backpackers ourselves and we do understand how much it mean for a giving hand in another country. No need to be shy, just ask us anything, we are here to help. #Credit Card/ Cash Payment accepted upon arrival. #2 days advance notice for no cancellation fee. #Smoking free in common areas and rooms, please smoke in designated areas. #$1 discount for Student with ID at check-in. #Passport or ID required, we do not accept kids under 12. #Reception open from 7AM - 11PM. Other request, let us know in advance. #Sheets/Pillow cover changed upon request. Staff were very nice and helpful. We love the open space and the place is very close to the beach. The only problem are the toilet they are located outside which is a problem if you wake up in the middle of the night and want to use them. Lovely dog companion and staff at the hostel, helping us with every inquiry we have. The atmosphere is excellent with an unique concept and open area in the middle, alongside a great location right next to the beach. However, the cleanliness can be improved--there were ants on the walls--and more amenities would be appreciated. Air conditioner unit can also be quieter.. Free breakfast means DIY meal but only adds onto the hostel vibe. Overall, a stay quite well enjoyed! Really cool concept to stay in packing containers. Staff was friendly and helpful. Mosquitos were a major issue. Please install screens or mosquito nets around the fans. Spent the night getting eaten alive by mosquitos. 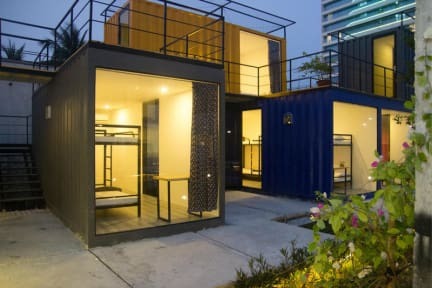 Hostel itself is beautifully designed, very modern and the shipping container look is cool! Rooms are pretty comfy and clean, and air conditioned. Bathroom pretty basic but clean. Staff were friendly but didn't really give any information on arrival - where bathrooms were, when breakfast was, the fact there was a curfew, etc - to be fair, all of this is on the website, but it's helpful to be told this kind of thing when you arrive. Overall good. It does seem to have many local youths staying in this hostel but there's not much interactions with foreign travellers. You have to clean up after yourself after breakfast which is no problem at all until I witnessed people rinsing their used bowls and utensils without using dish detergent??? So there's a chance you're using some dirty bowls for breakfast. You can't wash them beforehand because the cooking lady always prepare the noodles in the bowl for you. The rooms are okay. A good place to stay which is very close to the danang beach. Only issue was that the bathrooms weren't great. Really young students managing who don't understand English too well. I believe there are other options in Danang, explore them. Will give this one a skip next time. The only thing this place has going for it is it's location it's a 1 minute walk from the beach. Other than that the beds well you may as well sleep on the floor that's how hard they are ... the blankets don't even cover your whole body. It's bloody hot during the day even with the air conditioner on and at night time the room we were in the light outside the main door had no off switch and there was no curtain for the windows on the door so one half of the room and some of the beds were lit up. The place had a real bad mosquito problem and it had no atmosphere whatsoever.